SkyTruth founder and president John Amos testified yesterday before the House Natural Resources Committee regarding our work on hydraulic fracturing (fracking) chemical disclosure, and the Bureau of Land Management’s upcoming decision on regulating drilling and fracking on 750 million acres of public and Tribal lands. 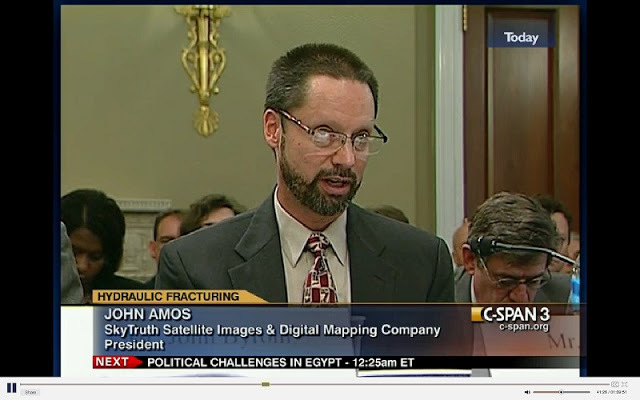 The hearing was entitled “DOI Hydraulic Fracturing Rule: A Recipe for Government Waste, Duplication and Delay.” Our testimony addressed the need for public disclosure of chemicals used in fracking. We think this should be accomplished on a user friendly, government operated website that encourages public use and sharing of the data without any restrictions, and allows easy aggregation and bulk download of the data. 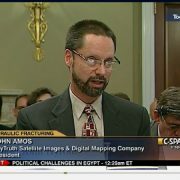 John’s full written testimony can be found here. 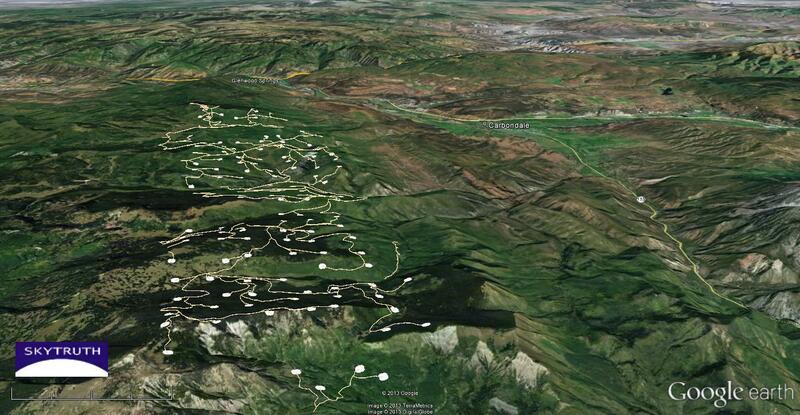 Data fans: check out our fracking chemical database and show us what you can do. 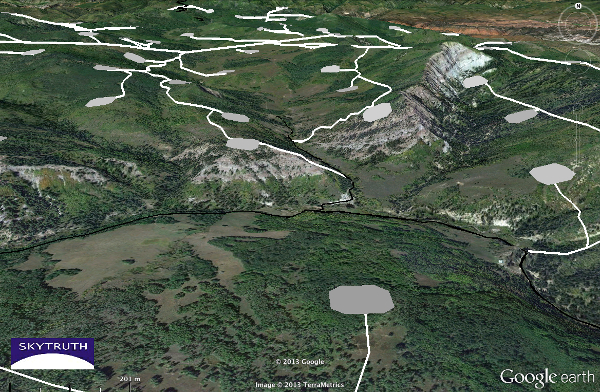 Bottom: SkyTruth simulation of the same area of the Thompson Divide overlain with simulated five-acre well pads and new service roads (in white). To see more views of our simulation, click here. 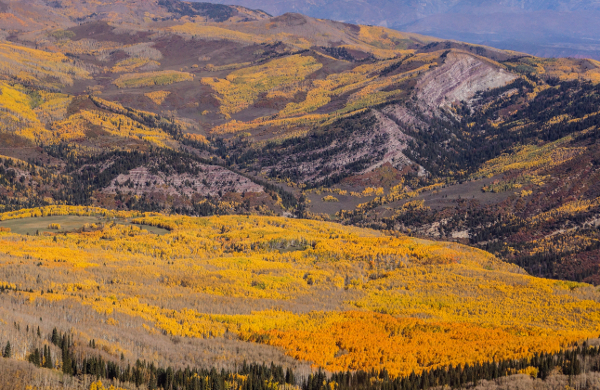 Recently, the Bureau of Land Management (BLM) announced they would temporarily suspend 25 oil and gas leases in the Thompson Divide, a wild swath of backcountry covering 221,500 acres of public land in western Colorado. Because the lease holders did not diligently develop these leases and are running out of time on their ten-year lease terms, they asked BLM for an extension. While this decision paused the clock on drilling for natural gas in this rugged portion of the White River National Forest, our friends at the Wilderness Workshop and Thompson Divide Coalition, as well as thousands of people from around the country, were pressing for BLM to allow the leases to expire this year. 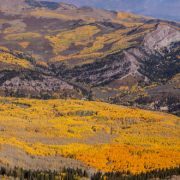 The Lake Ridge unit of the Thompson Divide is a high quality backcountry dominated by roadless areas reaching from the Sunlight Ski Area (south of Glenwood Springs) in the north to McClure Pass (between Carrbondale and Paonia) in the south. It is heavily forested, spans five watersheds, and provides valuable habitat for lynx, mountain lion, bear, moose, native cutthroat trout, and elk. Recreation, grazing, hunting and fishing in the area brings $30 million a year to Colorado’s economy. However, developing gas in this region would require intensive horizontal drilling and hydraulic fracturing (fracking), and new roads would have to be built in roadless areas. Looking southwest over our simulation of drilling in the Lake Ridge Unit of Thompson Divide from north of the Sunlight Ski Area. To see more views of our simulation, click here. Surface disturbance, habitat fragmentation, persistent noise, air and water pollution, heavy truck traffic, and industrial accidents are some of the issues the U.S. Forest Service and BLM will have to consider in their environmental analysis of the impact that drilling will have on this public land. To help visualize what this unconventional gas development could look like in this unfragmented swath of backcountry, we traced out access roads and 132 five-acre well pads onto Google Earth imagery of the Lake Ridge Unit west of Carbondale. Looking north over the Thompson Divide with Carbondale to the northeast. To see more views of our simulation, click here. While gas wells, roads, pipelines, compressor stations and other infrastructure would fragment the Thompson Divide, a wide range of stakeholders and citizen groups have joined together out of concern for this valuable resource. Local citizens have united with the goal of preserving the existing value and uses of the Thompson Divide, and we hope our simulation will help put in perspective what the future could look like if the leases are developed when BLM’s suspension ends on April 1, 2014. 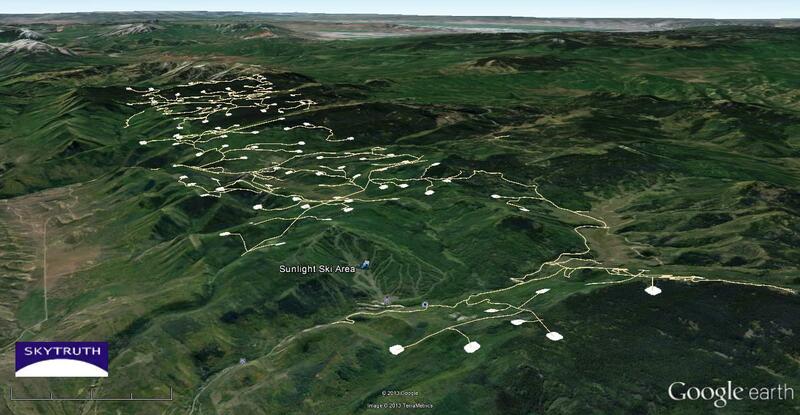 Watch the video below to take an aerial tour of Thompson Divide as it looks today. A Divide United from Peter McBride on Vimeo.